The social issues of our age have the power to provoke either curiosity or fear – both aspects of what it means to ‘fascinate’. 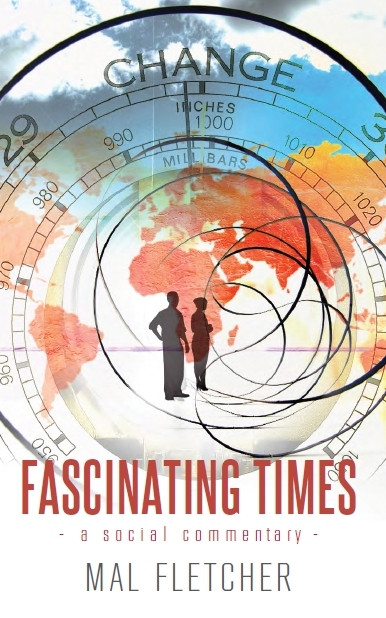 FASCINATING TIMES takes a sharp-eyed look at some of the major technological and social challenges of our time and explores their potential impact on social ethics and the future of society. The human impact of new technologies and shifting medical ethics, the long-term effects of recession, the future of media and the press, the changing face of consumerism, the future shape of marriage – these are just a few of the issues explored. Extras include: Group Study Guide, Personal Reading Guide, Online Media Resources. Note: This book is available only in e-book form, via Amazon Kindle. You do not need to own a Kindle to read it. To download free software for almost ANY digital device, click here. Click on the relevant link below to buy Fascinating Times now. Also available for AMAZON KINDLE at Amazon Kindle Store. In a world of increasing complexity, we need to be alert to the ideas that shape our values and behaviour. There are five big ideas that shape today's increasingly globalised culture. Though we seldom dwell on them consciously or deliberately, these powerful concepts often shape our responses to the big questions of life. Mal Fletcher shows how these dominant concepts differ from those that underpin the kingdom of God announced by Jesus Christ, and shows how we can shape the culture more than it shapes us. Includes a further study guide, plus recommended reading and viewing lists (92 pages). Other e-book versions also available (see below). If we don't invent the future someone else's vision of the future will reinvent us. Contemporary church is great, but it's not enough: we are in touch with the times so that we can become prophetic, ahead of the times. The Church of 2020 is a truly prophetic book -- futurism at its best. It outlines some of the likely changes coming to our world and shows how Christians and church leaders can proactively shape the future of cities. E-book version also available (see below). Gen-Xers are now filling major positions of influence in business, media, entertainment, education, law, politics and the church. If you count yourself a member of this unique generation, you must grab the opportunity for influence while you can. With some help from above, you can take your generational identity and personality, submit them to a higher promise and call, and realign the history of the world. E-book version also available (see below). Many people in today's western world are not only open to the idea that there may be a God; they're positively curious about what he is like! As Christians, says Mal Fletcher, our primary call is to challenge the world-view of our time and "make God famous". We need to reveal what God is like, in away that relates to real people and answers real questions. E-book version also available (see below). Christians are not called to celebrate the past, says Mal Fletcher, but to redesign the future - in line with the values of God's kingdom. To do this, we will need to think strategically, live passionately and release all of our God-given creativity. For centuries, the church produced some of the most transformative pioneers in history. It is time to re-dig those wells and release again the pioneer spirit. E-book version also available (see below). Have you ever noticed how hard it is to get the answers you want? This book will point you in the right direction. You'll be amazed at the range of vital issues it covers: from choosing a career to saving the planet, making money, keeping fit, feeding the poor, equal rights, homosexuality, astrology and abortion - it's all here. Mal Fletcher tackles the issues your generation are concerned about and comes up with some convincing answers. E-book version also available (see below). for your PC, Mac, Tablet, Smartphone or eReader. Note: This book is available via Amazon Kindle but you do not need to own a Kindle to read it. 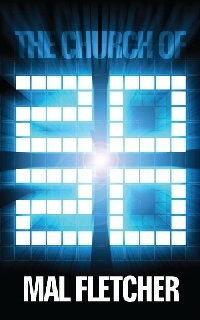 To download free software for almost ANY digital device, click here. In a world of increasing complexity, we need to be alert to the ideas that shape our values and behaviour. 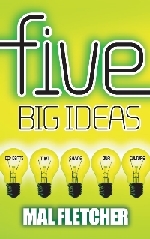 There are five big ideas that shape today's increasingly globalised culture. Though we seldom dwell on them consciously or deliberately, these powerful concepts often shape our responses to the big questions of life. Mal Fletcher shows how these dominant concepts differ from those that underpin the kingdom of God announced by Jesus Christ, and shows how we can shape the culture more than it shapes us. Includes a further study guide, plus recommended reading and viewing lists. If we don't invent the future someone else's vision of the future will reinvent us. Contemporary church is great, but it's not enough: we are in touch with the times so that we can become prophetic, ahead of the times. The Church of 2020 outlines some of the major changes coming to our world and shows how Christians and church leaders can proactively shape the future of cities. Gen-Xers are now filling major positions of influence in business, media, entertainment, education, law, politics and the church. If you count yourself a member of this unique generation, you must grab the opportunity for influence while you can. With some help from above, you can take your generational identity and personality, submit them to a higher promise and call, and realign the history of the world. First time in e-book form! Many people in today's western world are not only open to the idea that there may be a God; they're positively curious about what he is like! As Christians, says Mal Fletcher, our primary call is to challenge the world-view of our time and "make God famous". We need to reveal what God is like, in away that relates to real people and answers real questions. First time in e-book form! Christians are not called to celebrate the past, says Mal Fletcher, but to redesign the future - in line with the values of God's kingdom. To do this, we will need to think strategically, live passionately and release all of our God-given creativity. For centuries, the church produced some of the most transformative pioneers in history. It is time to re-dig those wells and release again the pioneer spirit. One of Mal's classic books, now available as an e-Book! The greatest need in churches at present is the need for help in training youth for effective leadership. Many start out with great dreams but sadly, because of inadequate preparation, their fire dies out before it can really be channelled into leadership. Euthanasia: Is euthanasia really the most humane response to suffering, and where will it lead in future generations? Robotics: Where are sciences like robotics and nanorobotics taking us, and how might they affect what makes us uniquely human? Technology & Alienation: How is technology impacting the way we relate to each other, to our world, and to God? For our policy on credit/debit cards, returns etc., please see: FAQ Donations and Products. Hey Mal - great article on your trip to Bradford!! I heard you speak for the first time yesterday [Rhema Church, Jo'burg]. I will definitely be buying the CD's of your services at our conference. Most impressed with this website.